I made turkey burgers for dinner last night. I can't eat turkey burgers without sweet potato fries. When I was making dinner last night, my eyes were bigger than my stomach, because I made way too many sweet potato fries. So I popped them into a container and stashed them in my icebox. Fast forward to this morning, when I was rummaging around looking for something to make for breakfast. I saw the container of sad little sweet potato fries on the shelf. I started thinking about what I could do with them... what about some kind of hashbrowns? I had about 1/8th of a bag of regular frozen hashbrowns in the freezer... an idea began to take shape. In an 8inch cast iron skillet (or non-stick if that's what you've got), melt the bacon grease over medium high heat. Add the chopped onion and let it cook for a few minutes. Then add the sliced mushrooms, and again, let it cook for a few minutes. When the veggies have cooked down a bit, throw in the cut up sweet potato fries and the shredded hashbrowns. Stir it around, then let it sit for a few minutes. Add salt and pepper. Don't over do it, as you can taste it along the way for seasoning. I don't use much salt because the bacon grease has some already. You want some color on the potatoes and veggies. After 5 minutes or so, make a well in the center of the mixture and put in the extra tablespoon of butter. Stir things around, and let it continue to cook until the other stuff you're having for breakfast is done. I served this to my husband with a couple of scrambled eggs. The picture you see was my portion, which I topped with a fried egg. This was really good. 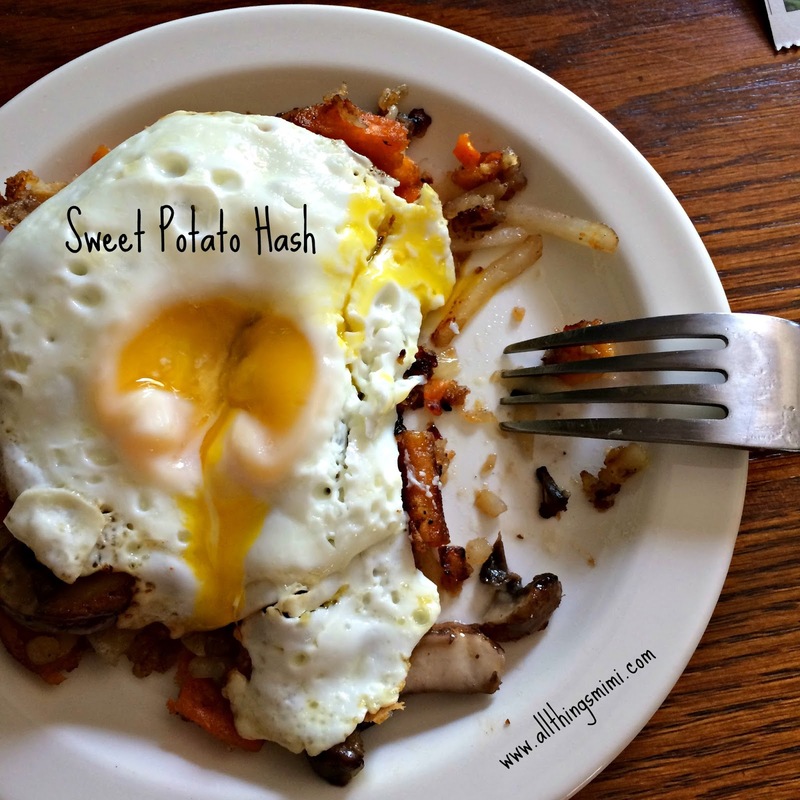 I think from now on I'll make too many sweet potato fries on purpose, just as an excuse to have this for breakfast again!